Monday 16th February 1’7” and 40 degs a calm sunny start and fish showing in the Cauldstream, Quentin McLaren was in there like a rat up a drainpipe but despite his and Pauls best efforts they never had a touch, meanwhile on the Temple John Clancy (Yorkshires onion growing champion) pulled out a Salmon Kelt then followed it up with another from the Cauld, that was the total for the morning but to see something in the Cauld at last gave us all a bit of hope. This afternoon I took Clancy down to Learmouth stream and fighting our way through the swans gave it a good thrashing which resulted in a very well mended Kelt, one of those ones where you have to check twice. With only 5 fish reported off the river we are all still waiting for a run to arrive but I’m sure it’ll turn up tomorrow; meanwhile I now have to prick out my onion seedlings that Clancy brought me so watch this space in September to see if I’ve won first prize again and there should be loads of fish to write about by then. It’ll be better tomorrow. Tuesday 17th February 1’11” and 38 degs so spinning allowed at this height and bigger which was lucky for us as a bit of a wind was blowing which was fine if you were in the boat on the right bank of the Cauld but bit rough on the Temple. John Clancy nearly managed a brown trout from the Temple while we discussed growing Tomatoes and blossom end rot, Graham gave the Cauld a good thrash with the fly and Quentin was blown about in Learmouth stream but all to no avail, Terry meanwhile looked after the fire and the day’s papers and stopped the whisky from evaporating. This afternoon Quentin brushed up his Spey casting from the boat in the Cauld and by the time he finished was casting miles, he then waded his favourite spot on the Lees the Tail of the Cauld but with a spinner this time as his arm were sore from all the Spey casting and he was casting straight into the wind, this paid off for him as he soon had a liced 8lb springer in the net and lost another two fish of some kind. The Tail of the Cauld is such a good place in spring, any fish that comes in there is going to see the fly/bait and Springers generally being good takers it’s the place to be. 5 fish off the river again today and spread from Lees to Boleside so there’ll be a lot of disappointed rods in the middle somewhere. Forecast wind again tomorrow which is a bugger as we have had a nice calm month so far. So, that’s us on two for the month it’s a numbers game now. Told you it would be better tomorrow. Wednesday 18th February. Last day for team Harper today and it ended with a blank, it was more than a tad windy which kept the midges away at least but did nothing to help the fishing and regular readers will know how much I love the wind. We didn’t see a thing all morning and by lunchtime the white flag was waved and it was off to sunny Yorkshire just in time for pork pies for tea. Drama of the day was Paul getting a puncture and the effort to get the wheel off when lock nut socket snapped, it involved two trucks a hydraulic ram, two jacks and much swearing but we got there in the end luckily it didn’t happen at the Glide rather than outside the hut. 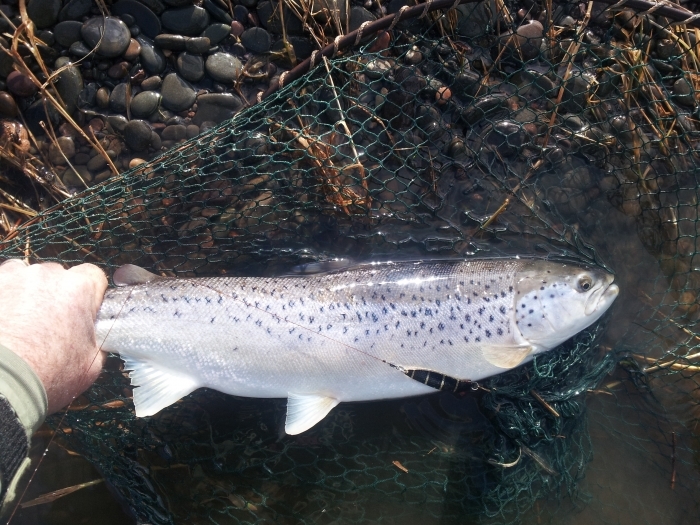 Only 4 fish off the river today 3 at Junction good for them, and 1 at Ladykirk which is well down for a fish at this time of year but they have to swim past to get to Junction so well done whoever it was. Less wind tomorrow and its team McLaren fishing so there will be much talk of cask strength whisky, nosing and a wee bit of fishing. 1’8” and 40 degs squeaky clean all we need is the fish to stop with us, a sheet of weldmesh in the Slap would do the job nicely. It’ll be better tomorrow. Thursday 19th February Stewart doesn’t work here in the spring but he’s a kindly soul and came down with the pasties for lunch because its Thursday, he’s nice that way. It was a big day for Jamie McLaren (no connection to the F1 team) as he caught his first Salmon on the fly, a brand new 9lber (1lb bigger than his Dads) from the tail end of the Cauld on a 1 Â¼” black and yellow tube, photos to follow. Jamie’s fish was the only action of the day apart from a wee Kelt late in the afternoon caught by Jeremy Corke who had resorted to a spinner as the river was up to 2’3”. 8 fish reported from the river on the websites but I heard that Cornhill had their first of the season today so that’s 9 and a bit more of a spread of beats. 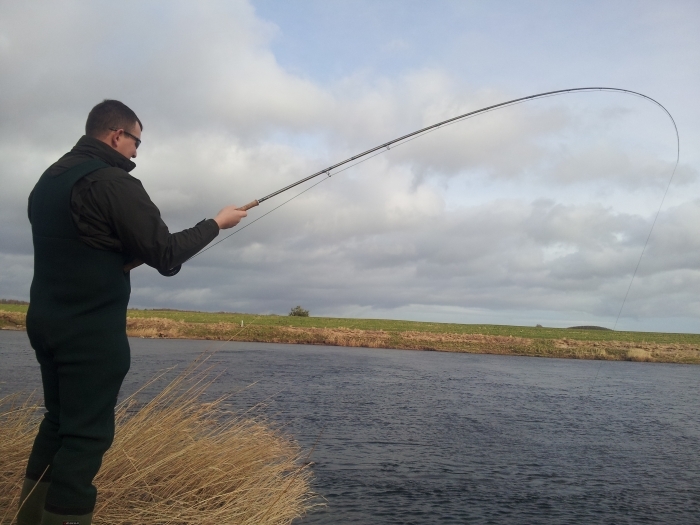 The Aquasure/Stormsure sales will be going up this week as 3 of the 4 rods today had wet legs. Friday 19th February What a difference day makes, 2’3” and 40 degs but very murky. It was Brian Perry’s turn in the boat on the Cauld and to be honest I didn’t think he had much chance of a Salmon and I was right as he got a 4 1/2lb Seatrout! It’s the sort of thing you might expect in murky water but not in February as they are rarer than hens teeth, it was down in the tail of the Cauld again and on the left bank in thin water. Later this morning we had a visit from a seal yet again, it came up from Learmouth stream almost into the Cauld but met Brian wading and turned back down. Two of the team waved the white flag at lunchtime and by 3.30 all were on their way home. The river was dropping back by the afternoon and by tomorrow morning should be much clearer, I hope. We have a serious Mole problem down the beat this spring I’ve had 12 so far and I’ve just reached Learmouth. Saturday 21st February A nice frosty sunny start 1’10” and 39 degs clean again. 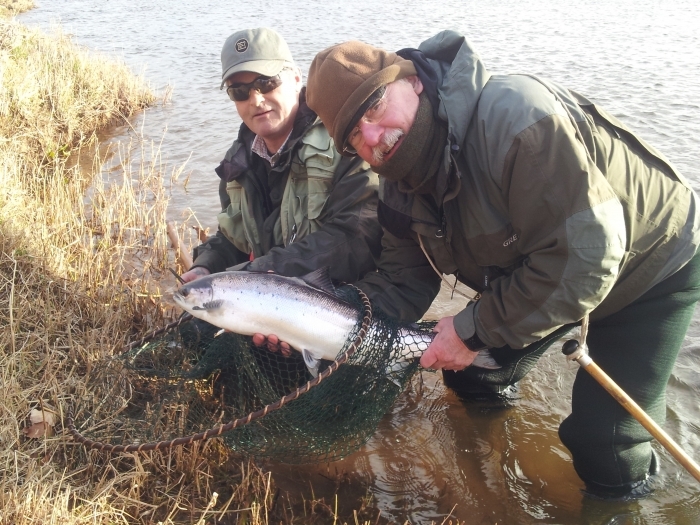 John McLeod and sandy Scott joined us today but even those pair couldn’t find a fish today, Rory McLaren test pilot for Borders airways (the only member of the family with waterproof waders) also failed and he had first dibs at the Cauld. Brian Perry was top dog with a Kelt from the Bags although he did connect with a strong fish in Learmouth stream this morning but didn’t land it or see it for that matter so it doesn’t count its come to something when we are counting kelts and pulls! No sign of the Seal thankfully so I presume its headed back to Berwick. The water today was back to clean/clear and I hoped that the wee rise might have moved things about, brought a Kelt or two down or a springer up, but it just took the 6 fish caught on the river today straight past us, if they weren’t already up there. There we are almost rid of February one of the worst months of the year and the nights are drawing out a bit as its light until the back of five now, another month and the clocks will change and it’ll be garden time of an evening, I know you are all waiting to hear how the onions are doing. News man tells me there are supertides this weekend giving us the biggest spring tides in 20 years along with rain/snow tomorrow so we are bound to get a lift of water for Monday, any fish thinking about coming in should be up the river like a rat up a drainpipe and will be waiting for us on Monday. Photos are Quentin McLaren fish, Jamie McLarens fish and Brian Perry’s Seatrout.